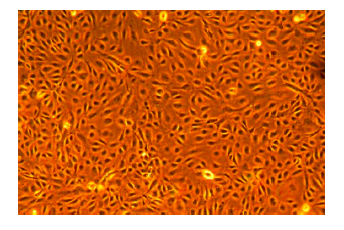 VascuLife® supports the growth of these cells in a low-serum environment without human VEGF. VascuLife® Basal Medium contains no antimicrobials and no phenol red. 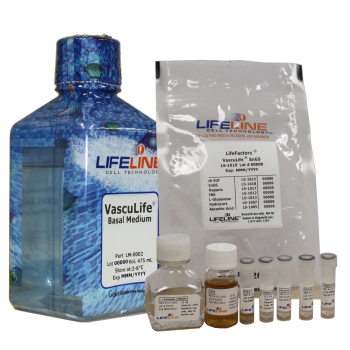 Kit format for formulation flexibility: VascuLife® EnGS culture medium is offered in a kit format composed of basal medium and associated supplements and growth factors called “LifeFactors®.” This kit allows you to prepare fresh medium in your laboratory, extending shelf life and enhancing performance. Protective packaging: VascuLife® Basal Medium is provided in a light-protected 500 mL bottle. The remaining LifeFactors®(growth factors and supplements) are packaged in a convenient gas-impermeable pouch for easy storage. VascuLife® EnGS Medium grows HUVEC and other human large-vessel endothelial cells, without the addition of human VEGF, at rates that meet or exceed other commercially available serum-containing media while maintaining excellent cell morphology. In comparisons with other commercially available media, VascuLife® shows superior proliferation at different seeding densities. Shown at left: HUVEC, passage 2, 4 days after inoculation with 2,000 cells/cm2 (100X). Shown below: HUVEC inoculated at low seeding density in 24-well plates. Higher fluorescence represents a greater number of cells per well, and therefore, better proliferation.